This rich and hearty pressure cooker split pea soup recipe uses not only split peas but orzo pasta for a fabulous meal on a cold day. The combination of peas and wheat provides complete protein in this vegetarian meal. But if you aren't a vegetarian, you could certainly use chicken broth in place of the vegetable broth called for in the recipe. Beef broth would be a little heavy and would overpower the delicate flavors of this rich soup. Split peas are a special type grown just for drying. The hull is removed during processing, which makes the pea split along a natural seam. This splitting action exposes more surface area and makes the peas cook more quickly since they can absorb water faster. They don't need to be soaked before cooking, unlike dried beans. 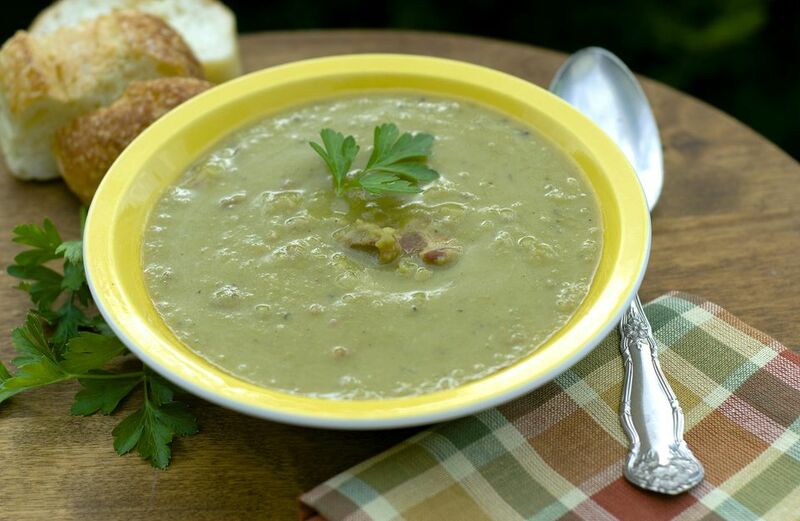 The split peas dissolve into the soup as they cook, and thicken the liquid. The soup is very creamy, rich with other vegetables and herbs. Make sure you understand your pressure cooker thoroughly before you use it. Practice locking the lid so you know how to do it easily. Follow the instructions for increasing, and decreasing pressure. And take your time when you first use it; don't rush the process. Today's pressure cookers are very safe. There are no worries about the appliance exploding, which happened (albeit infrequently) in the past. This wonderful soup is delicious served with some homemade crackers or breadsticks. A fruit or green salad is all you need to complete a hearty and warming meal. Heat oil in pressure cooker and saute the onion, celery, garlic, and carrots for 5 minutes, stirring frequently. Add the vegetable broth, split peas, thyme, chile pepper, salt, and pepper to pressure cooker. Cover, securing the lid tightly according to manufacturers' directions, and bring up to pressure. Cook for 10 to 12 minutes. Meanwhile, bring a medium-size pot of salted water to a boil, add orzo and cook until al dente. Drain well. Reduce pressure on the pressure cooker, remove the lid, and stir cooked and drained pasta into soup. Sprinkle the soup with Parmesan cheese and serve immediately.